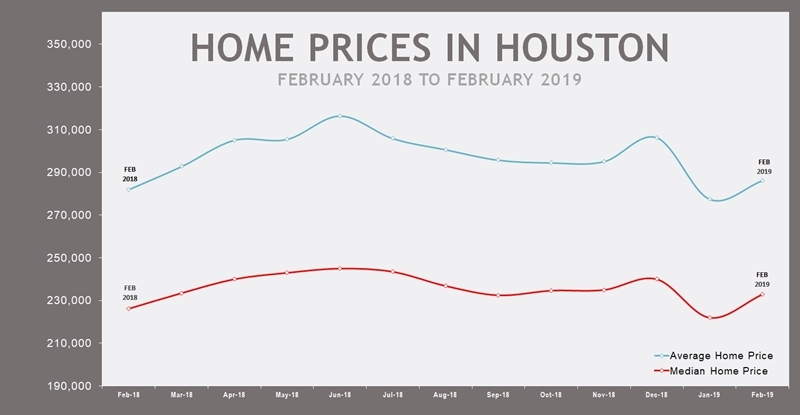 After a sharp slow down in January, the Houston real estate market showed an uptick in February. Unlike January, sales in February rose among homes priced between $150,000 and $750,000. Overall, inventory continued to grow, generating an improved supply of homes for home buyers as the spring buying season gets going. According to the latest monthly report from the Houston Association of Realtors® (HAR), 5,280 single-family homes sold in February compared to 5,265 a year earlier. These gains end 3 consecutive months of decline over the holiday months. The single-family home median price rose 2.9 percent to $232,900, and the average price increased 1.9 percent to $286,156. Both represent the highest prices ever for February. According to the Houston Association of Realtors, month-end pending sales totaled 7,310, a 15.4 percent increase over last year. Total active listings, or the total number of available properties, jumped 17.4 percent to 39,304. Days on Market (DOM), or the number of days it took the average home to sell, lengthened slightly from 66 to 68 days. Current market conditions continue to present a great opportunity for home buyers that are ready to enter the market. Rising inventory levels present more choices for home buyers. Furthermore, according to Mortgage News Daily, mortgage rates have been sliding over the past several months. With the recent announcement by the Federal Reserve that they may hold their key interest rate steady for the remainder of the year, the mortgage rate environment may stabilize over the coming months. Steady mortgage rates, coupled with rising oil prices, could bode well for the Spring real estate market in Houston.